There’s something—maybe just something cultural, maybe something embedded in the human genome—but something about the cold dark days of winter prompts me to want to preserve and protect things. I have a wooden spoon that I use to stir up Bubbles, our sourdough starter. (Folk wisdom is to avoid using metal tools with a sourdough starter.) 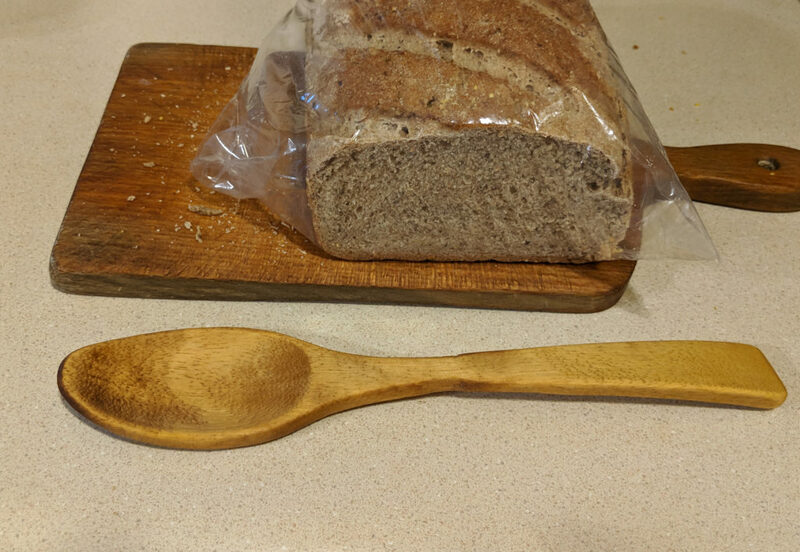 I’ve used this spoon for many years now, and after all those years the wood was getting a bit furred. So last week I got out some sandpaper, sanded down the rough bits, and then treated the wood with oil. I did the same thing with the wooden cutting board we use for the bread loaves. With this task in mind, I got some flaxseed oil at the grocery store, with an eye toward it being a pretty finishing oil, as well as being food-safe. 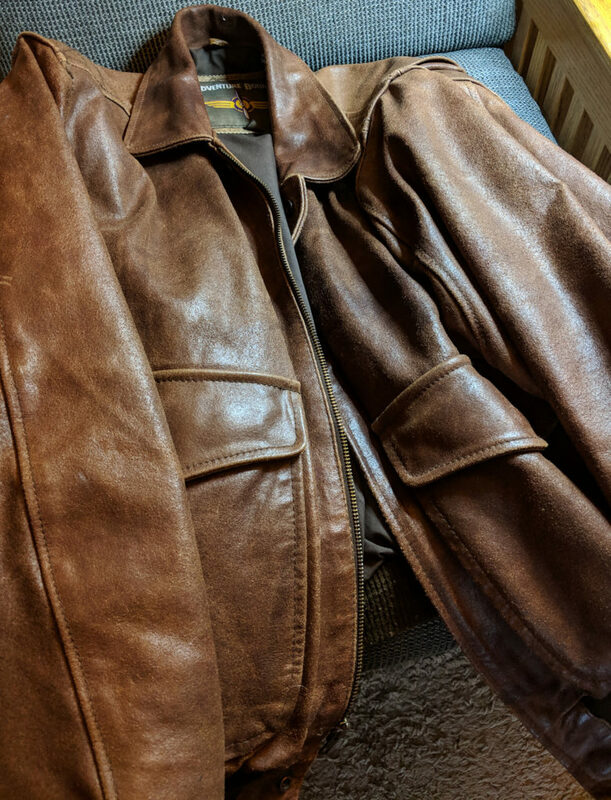 I also have a leather jacket that I got more than 25 years ago when I was learning to ride a motorcycle, and that was similarly showing its age, and also needed a nice rubbing down with oil. For the leather jacket I used neatsfoot oil. (It’s worth following that link. Neatsfoot oil is interesting stuff.) As long as I had the neatsfoot oil out, I went ahead and oiled a pair of leather boots too. In all these cases I’m pleased with the results—I protected and preserved something, while also making it more beautiful. But more pleasing than the results, I think, was the process. Rubbing something with oil is a simple process, but one that rewards mindfulness in a way that makes it inherently meditative. It makes caring for your stuff into a form of self-care, in the dark days of winter. I generally don’t think of myself as a scary person, but there are a few times when people have reacted in a way that made me think I frightened them. Here are three that made enough of an impression on me that I remember years later. When I was about 15 or 16, my mom took me to a restaurant near my high school. We gave our order, but just a minute later the waitress—a girl perhaps two or three years older than me—returned to say that they were out of french fries. I did my best to console her—I assured her that a burger with no fries would be fine—but I felt terrible. It was the first time in my life that I comprehended that I’d frightened someone. In college I worked at the computer center, and one year I spent a Christmas break helping to bring up a new version of the operating system. In those days, the college just had one computer, which did both administrative stuff (like printing checks and addressing letters to alums) and stuff for students and faculty. The new OS was not yet trusted to handle the administrative tasks, so I was starting work after the administrative users of the computer finished up at 5:00 PM, and then heading home late at night, often after midnight. It was a long walk to where I was staying, so I took the shortest route I could. One stretch had me cutting at an angle through a parking lot, reaching the next street in the middle of a block. One day I stepped out of that parking lot, onto the sidewalk—and found myself right at the door of a car with a African-American woman and a couple of young children inside. The woman, seeing me come out of nowhere (not down the street from ahead or behind) right up to her car, hurried to lock her car doors as quickly as possible. I have always been a little ashamed that, for just a moment, I thought, “But I’m white!” as if that should have made a difference. One of my coworkers helped teach a motorcycle safety course and convinced me to take it. 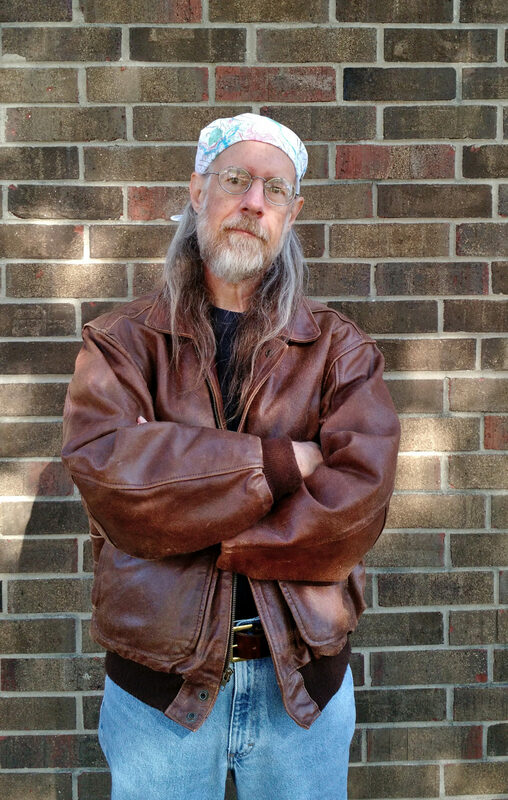 I bought a helmet (required to take the course), a leather jacket, got my motorcycle endorsement, and in about 1990 or 1991 I bought a motorcycle and started riding it to work. One day I ran a mid-day errand at the mall, and decided to stop at fast-food restaurant for lunch. That particular restaurant had railings set up to encourage people to form a single line, and I took my place at the end of the line. The next time the person at the front departed, the people in the line moved forward a bit too aggressively. Finding themselves bunched together, the people at the front of the line moved back, forcing the people behind them to move back as well. The person in front of me took a step back without looking, and bumped into me, hitting the motorcycle helmet I was carrying in my hand. Having bumped me, he turned to look at me—and lurched away again from the terrifying visage of a guy in leather jacket with a motorcycle helmet, bumping into the guy ahead of him, producing a whole second cycle of to-ing and fro-ing for the whole line. There are several factors that go into making someone dangerous. In particular, there’s the difference between having a capability to do harm versus having an inclination to do harm. Absent actual knowledge, other people have to rely on markers for each of these things. A raised voice, a sudden appearance in an unexpected place, the dress and accoutrements of a certain category of people all can serve as such markers. It is a commonplace of action fiction that those who are themselves dangerous can spot the difference between someone who is actually dangerous versus those who merely pretend. I don’t think a fictional action hero would have been fooled for a minute in any of those incidents. I’ve begun to notice, though, that there’s some truth to the idea that you can tell the difference between those who are dangerous because they have skills versus those who are dangerous merely because they are volatile. Thanks to my taiji practice (especially teaching taiji) I’m beginning to notice a few of the things that go into the calculation—being balanced, being centered, being ready to move. It’s actually kind of unhandy—noticing such things has made it harder for me to put my attention elsewhere—making it harder to play Ingress, for example. I don’t think of myself as scary, and I certainly wouldn’t want to project an aura of menace all the time. But being able to project menace is an ability that probably has its uses in real life as well as in fiction. I very much recognize the position of privilege I’m speaking from here. More than a few people have died recently, because someone with a gun thought they were menacing—even when they were running away, or standing with their hands up, or lying down on the ground with their hands up. Dressing for . . . It was on my first trip to England that I came to understand that what we think of as formal wear, business attire, and sports clothing was originally designed to be the most comfortable possible clothing for the circumstances. The circumstances in this case being the climate, technology, and infrastructure of England in the eighteenth and nineteenth century. Without central heat interiors were going to be chilly, but even if you were quite frugal with your wood or coal they would not have to be really cold. Given those indoor circumstances, and given that you had to make do with wool, silk, linen, and cotton (because there were no synthetic fibers), you would quite naturally end up with just the sort of garments that we now think of as being part of formal wear—wool coats and vests, silk bands to wrap around your neck, and so on. Sport clothing, of course, was for the sort of sports the English aristocracy engaged in: riding and shooting. Tweed and leather were very practical. It seems obvious now, but it was something of a revelation to me. When I was younger, I always thought of that sort of clothing as being uncomfortable. Partially that’s because such clothing is only really comfortable if it really fits. You don’t need a bespoke suit for it to fit correctly; even today good men’s clothing is routinely altered to fit. But clothing purchased for a child will never fit for long (and often never fit at all, because the child knows neither how the garment is supposed to fit nor how to articulate any issues discovered during the fitting). Perhaps more important, such clothing is only comfortable in the sort of very cool environment for which it was originally designed. If your interior temperatures are around 60°F, you will be more comfortable in a wool coat over a wool vest than you would be in shirtsleeves. At 70°F it will be the other way around. My attitudes toward such things has also been influenced by Jackie’s work with fiber. In my youth, my experience with wool was that it was scratchy, uncomfortable stuff (totally aside from it being made into garments that didn’t fit and were wrong for the climate). Now I’ve learned about the many different kinds of wool—starting with merino, of course, but by no means ending there—that are not scratchy. Now I have wonderful vests and sweaters, made to fit, from premium materials. Of course, the top layers are really the last thing to think about. Comfortable clothing begins with the base layer. There again, my experiences as a child turned me against a whole very useful category: long underwear. Any clothing that you’re going to put another layer of clothing on top of needs to fit exactly right. An outer layer that’s too loose can be tolerated. But a too-loose under layer is going to get bunched up and shifted away from where it needs to be: Intolerable. As a young man, I think I’d have been perfectly happy to wear nothing but shorts and t-shirts, and simply crank up the heat to make up the difference. My attitude has changed. If I had the money, I’d be very pleased to get and wear wool coats and vests, silk cravats, smoking jackets, and the like. Not because of the fashion statement they’d make (which would be a rather silly statement, however much I’ve come to appreciate a fine tweed), but because they’d be very comfortable. Author Philip BrewerPosted on 2013-01-05 2016-11-19 Categories Economics, Energy, NewsTags clothing, coat, cotton, cravat, dress, dressing, fiber, fiber arts, grownups, leather, linen, scarf, silk, sport, suit, tie, vest, wool, woollies2 Comments on Dressing for . . .